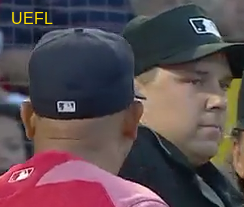 HP Umpire Adam Hamari ejected Red Sox Manager Alex Cora (warnings/non-ejection on high-and-inside fastball; QOCU) in the bottom of the 1st inning of the Yankees-Red Sox game. With none out and none on, Red Sox batter Mookie Betts took a first-pitch fastball from Yankees pitcher Luis Severino high-and-inside for a called first ball, resulting in warnings. Replays indicate the pitch was located near Betts' upper right shoulder and neck area, the call was irrecusable. * At the time of the ejection, the game was tied, 0-0. The Red Sox ultimately won the contest, 4-1. This is Adam Hamari (78)'s 2nd ejection of 2018. Adam Hamari now has 2 points in the UEFL Standings (0 Prev + 2 MLB + Irrecusable Call = 2). Crew Chief Phil Cuzzi now has 1 point in Crew Division (0 Previous + 1 Irrecusable Call = 1). *Per MLB Standards for Removal policy, leaving the dugout to argue warnings is an automatic ejection. This is the 108th ejection report of the 2018 MLB regular season. This is the 45th Manager ejection of 2018. This is Boston's 3rd ejection of 2018, T-3rd in the AL East (NYY 7; TOR 6; BAL, BOS 3; TB 1). This is Alex Cora's first ejection since August 25, 2017 (Laz Diaz; QOC = U [USC-NEC]). This is Adam Hamari's 2nd ejection of 2018, 1st since July 14 (Rick Renteria; QOC = Y [Check Swing]).